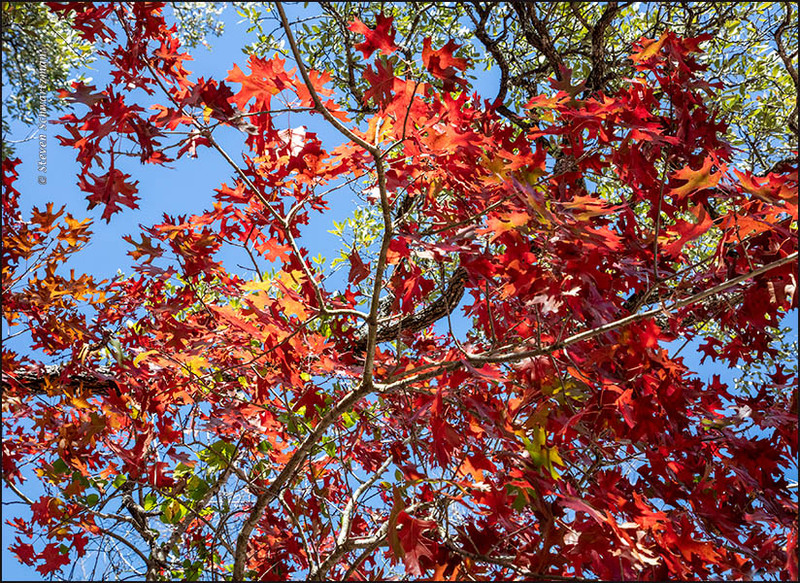 The red oaks’ color seems to have been especially vibrant this year. Even here, where the trees aren’t so numerous, they were easy to pick out. I like the symmetry between the two arcing trunks and the two upraised ‘arms’ of red in the first photo. Even though so many leaves remain, they bring Coleridge’s words to mind, with a slight revision. Speaking of looking up at the sky: here and there in the woods in my part of town yesterday I kept noticing very young red oaks, pushing up maybe half a foot off the ground and with only a few leaves, and those leaves spreading horizontal to catch whatever light they could, yet even at that earliest stage of the trees’ growth the leaves that were the first of their clan had turned shades of red. This just occurred to me. The next time you’re in Bastrop, you might drop down to Waelder and see if you can find an arc there. I think the people in nearby Flatonia might be more in need of an arc. It’s a beautiful setting, so nicely framed, Steve. The colour of the oak is stunning. Happy Holidays and a healthy, happy New Year! Thanks for your holiday good wishes, Dina, and the same back to all of you. 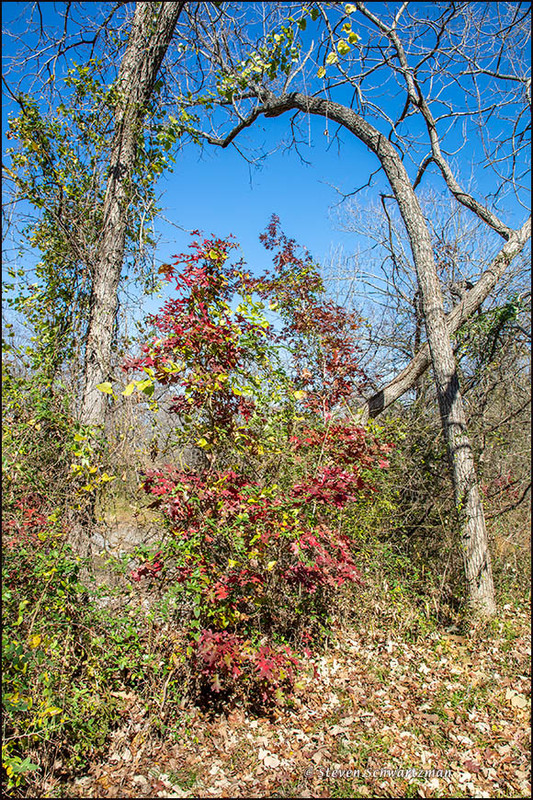 Yes, the way the tall tree trunks framed the young red oak fascinated me, and I had to take that picture. The greenbrier vine climbing up so high was a bonus. What a great frame for those pretty colors! As much as I liked the even brighter oak leaves in some other places, this one was special because of the natural framing. I hope other people noticed it too. Have you ever seen the Circus Trees of Bonfante Gardens, which is now Gilroy Gardens? They were grown in Scott’s Valley, close to the farm, and moved to Gilroy years ago. Many of our rhododendrons and camellias also went into the park. The trees were developed using common horticultural techniques, but they amaze those who do not understand how such things work. What strangeness. I noticed how many of the trees are sycamores. I wonder why people so often chose that species. That is a common observation. There were also privets. Most of the trees were the trashy sorts, and the trashiest and simplest were the ones that survived. There were more interesting specie, but they did not survive. The Circus Trees were abandoned for a long time before being moved to Gilroy. Hmm… To my mind, sycamores aren’t a trashy species at all. I’m quite fond of photographing them. These are the London plane trees. Although they can make nice big shade trees, they do not work so well in overly refined landscapes. The native California sycamore is a grand tree, but was not used because it is not so cooperative. Some of the other trees used were holly oak (which is always infested with one sort of homopteran insect or another) and viburnum. Some of the original trees were pears and apples, but they did not survive. One of the specimens was left at the original site when it was redeveloped into an office complex, but gardeners actually cut away the grafted arch between them to make them just a pair of very disfigured trees. Oh, those are rad. I think I saw something like them in a nursery in Oklahoma. The name got my attention of course. I thought it would be some sort of Crataegus. There were so many nice viburnums there, including the snowball bush. California seems to have gotten cheated out of the cool viburnums. Snowball bush is available, but uncommon. I’m just glad to have our native rusty blackhaw, also known as southern blackhaw. As you pointed out, it’s botanically unrelated to hawthorn, although etymologically the haw is the same. Well, we lack hawthorn too. Both are intriguing to me.